NAPLES -- The church is in the center of the town of Ave Maria in Florida. It dominates the main piazza like a European Cathedral, a Duomo, and it faces Ave Maria University. The church, the town, and the university are all dedicated to the Blessed Virgin Mary. The facade of the church, the Oratory, highlights a monumental high relief marble sculpture of The Annunciation by internationally renowned sculptor Marton Varo. The archangel Gabriel kneels respectfully before the striding Virgin emerging from the white marble. The art is both traditional and innovative and it signifies that the building is a Roman Catholic Church. Marton Varo is a figurative sculptor who understands beauty and he is experienced in showing the beauty of women. 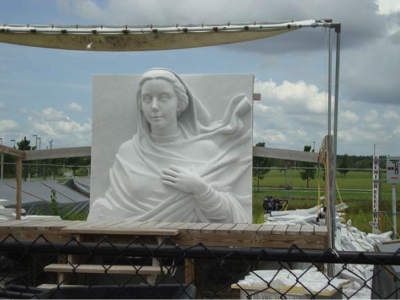 The Blessed Virgin Mary strides forward breaking the confines of the sculptural relief format. That is only one original aspect of this Annunciation. The scene is a break from the traditional Virgin figures who are shown surprised. Here, her pose indicates that this may be after her fiat, after her yes. Varo's Virgin is a substantial figure who is strong and active. We may read her expression not as surprised but as inspired. The Archangel Gabriel kneels respectfully before the Virgin Mary. We may imagine that as Gabriel left on his mission he may have asked, "Should I kneel?" Perhaps God responded, "Artists might show you kneeling, or on your toes, or in the air. Don't worry you will know what to do." He is in fact kneeling and the Blessed Virgin looks both humble and daring enough to have said yes to God's plan. That is an innovative interpretation because many historical representations show her as passive, perhaps reading or praying. We must remember that upon hearing this news she was immediately decisive and active in journeying to help her cousin Elizabeth. We may read the expression of the Virgin not as puzzled or contemplative before her decision, but as inspired after the fact of her "fiat", after her yes. Sometimes Artists compress time to tell a complete narrative. Gabriel is speaking and Mary has already said yes. But, we know that in the nature of relationships on earth, there is always a back and forth, and therefore there is always waiting. We may guess that here, there may have been a moment when heaven and earth waited for her yes. Another innovative quality of this sculpture is that the sculptor is a Direct Carver and every inch of the marble relief was touched by his hands. Contemporary Direct Carvers are as connected personally with their work as were Greek and Renaissance carvers who also worked themselves directly on the stone by hand. Modern Direct carvers began in the Twentieth century to reject the industrialization of sculptural practice. They insisted on carving themselves and they preferred that stone look like stone. Nineteenth Century American neo-classical marble figures that grace museums were carved by artisan copyists in Rome around 1900. American Sculptors like Hiram Powers and Thomas Crawford made the clay sculpture that was cast in plaster and then sent to a workshop. The sculptors would sign the completed copy. This was also the practice of Auguste Rodin who was a modeler in clay. Also unusual is the fact that most of this carving was completed on site, in the town, on campus, thereby enabling the whole community to became a part of the creative process. The sculpture saves the odd Post Modern building that kids call a space ship and that has been compared to an airplane hanger. Its silhouette, front and back, resembles a Bishop's mitre. Being Post Modern means that its identity, its function, can be known by how it looks. Strictly Modern architects did not care if you knew if their building was an apartment building, or a bank, or a church, it was all about their own edifying geometry. The architectural vocabulary of the Oratory, employing both masonry and steel, is a mixed metaphor, not having a particular style. The project did not have an architect, it was the vision of a businessman executed by engineers with no regard to the cannons of traditional Catholic Church architecture with its vocabulary of arches and domes and intending to contain religious art inside. It is recognizable now as a church because of The Annunciation sculpture. A parishioner objected to my characterization of the Oratory as an odd Post Modern building. In teaching at the Harvard Graduate School of Design, the Schoolof Architecture, I was required to define terms and understand movements such as Post Modernism. That does not mean that I don't love the church. It is my church too. Sacraments are lived there. 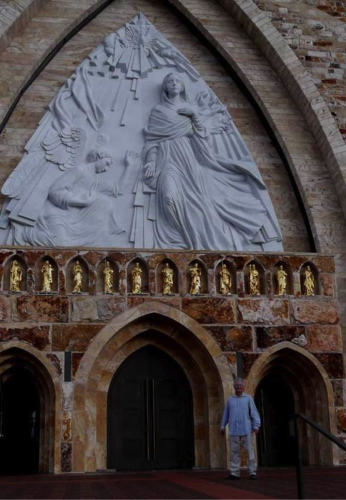 The monumental marble sculpture may be the most important religious art on a church in this country. It is remarkable because the sculpture takes up such a large percentage of the facade. It was designed for the space of the pediment as classical relief sculptures were and it is now part of the architecture. In our age of replication, mass production, and cheap mass media, it is important to understand how this art was created. It is completely original and represents the sculptor's vision. And it is about Beauty. of Beauty, Art, Sanctity & The Truth of Catholicism ,Ignatius, 1997. Picking up on Saward's concept of beauty, it is clear to see that Marton Varo is a sculptor who understands beauty. He does not make political art, he does not make decorator art to match design schemes. Lest anyone think art like this is extravagant I remind them of a sentence by Pope Benedict that reifies the truth that art is not superficial but essential to the Church. "The only really effective apologia for Christianity comes down to two arguments, namely, the saints the Church has produced and the art which has grown in her womb." -Cardinal Joseph Ratzinger, The Ratzinger Report, Messori, 1988. I have suggested that the Annunciation is significant because it is a unique grand monumental architectural religious work of art and further that it is about beauty. The beauty of the message and the beauty of the sculptural form are combined and work together. The normal procedure for a work the size of the Annunciation would be for a committee to approve a small model that would be sent to Cararra or Pietrasanta, Italy to be enlarged in marble. With some luck in a few years one could expect at least a decent copy. There would be no guarantee that what looked good at three feet high would work at thirty feet high on the building. It is as though the University does not understand the significance of this monumental work of art. From its creation it has not been represented on the university website in any significant way. I have been told that that is because it is thought to project extravagance by an Administration that is tasked with balancing the books. I do not know if that is true. However, it is odd that last year on the Feast of The Annunciation, at the dedication of the University to the Blessed Virgin, in front of the Sculpture and the Oratory, that the sculptor was not invited, whereas the financial donors were honored standing next to the University President and the Bishop. Some friends of Marton Varo held a small private reception for him in town that evening. Marton Varo worked for long hours each day in public before the whole community. Covered with white marble dust, (and "looking like a baker" as Leonardo da Vinci said of Michelangelo) he would stop and answer questions for students and pilgrims. When asked at a discussion forum, when the work was nearing completion, if the Virgin Mary had communicated anything special to him, he responded, "Yes, she said keep working."